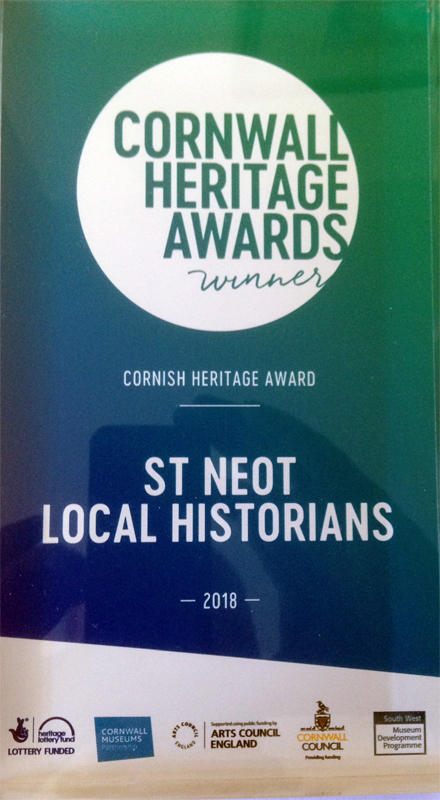 The award came with a cash prize of £500 which the Historians will use to digitise Mary Bellringer's films of St Neot and help to support a second community dig this summer. Our thanks go to everyone who made 2017 such a success. 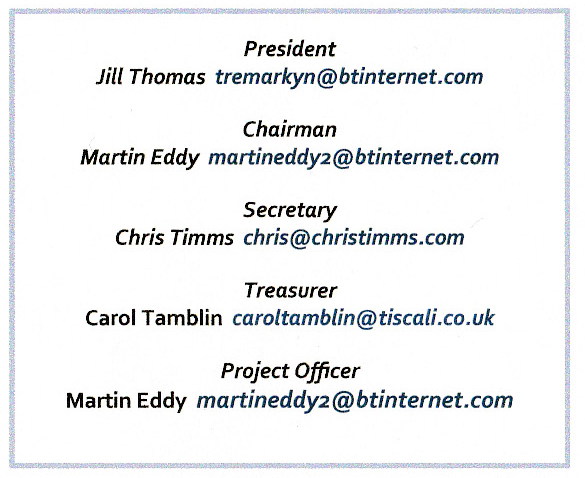 Contact Chris Timms for other times if you can't manage the above. Below is some of the past history of the Archive/Historians and how the Archive came into being. For a more up-to-date account of our activities have a look on the Meeting Reports page, you could of course come along to one of our meetings shown on the Programme page. During the week commencing 9th January 2016 the Archive was moved downstairs (below where we were). This well organised move was undertaken by members of the Parish Council aided by some Historians. The Archive is now housed completely in the downstairs room, we now have our own groundfloor level access "front door". We still have use of the kitchen and toilet within the main biulding, accessed outside but under cover. The new facility is much warmer and affords us more shelf space. Come in and have a look at the new room. Have a look at the new page Remembrance Day Booklet. Our Heritage Lottery Fund grant has now been concluded and the finances passed and "signed off". Below is a copy ofthe newspaper report of our final act! please use the "contact us" page for further information. 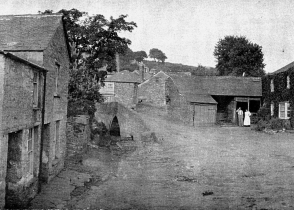 This picture of Cott Barn (extreme right) was taken prior to 1906. Oliver Bligh is standing in white shirt by the gate. Oliver is mentioned in the January copy of the 1908 St Neot News. 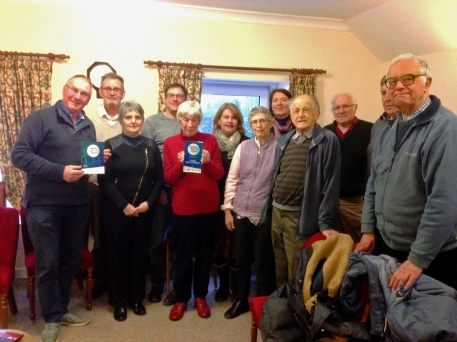 Local people and visitors alike will be able to learn more about the traditional Oak Apple Day celebrations held annually in the village of St Neot, thanks to a grant of £8,200 from the Heritage Lottery Fund (HLF)." 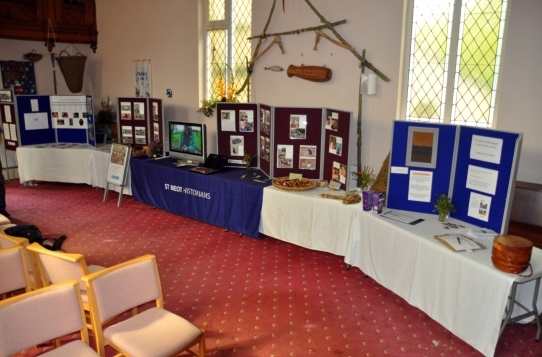 This website has initially been built to show the material recorded from the Oak Apple Day celebration in 2013 and the archived images etc taken in the village during the month of May. It will also subsequently contain historical information about St Neot, Mount and Warleggan that has previously been kept by the St Neot Local Historians and the Warleggan Historians. Please explore the pages, they can be accessed via the buttons on the right hand side of the pages. 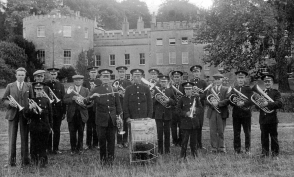 The St Neot and Warleggan Archive is administered for the benefit of all in the parishes it covers. 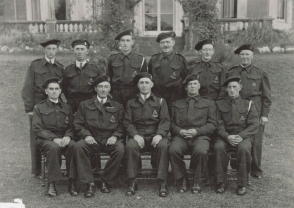 The group of volunteers maintaining the archive and digitising and cataloguing the contents of the community archive come mainly from the St Neot Local Historians. The Archive will be open on at least one day per week and there will be evening and daytime exhibitions. The time and dates of the exhibitions and continuing opening hours will be in the "St Neot News" and on the St Neot Parish website on the "Events" page and on this site. The pages on this website give a representative sample of what we have in our archive, please refer to the Catalogue page for a details of what we have. We are not able to put the vast amount of material we have in full on the site! 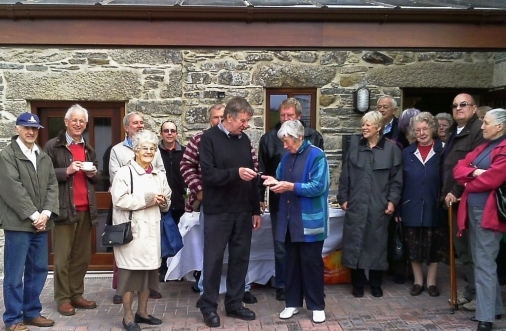 The Cott Barn Rural Resource Centre is administered and owned by St Neot Parish Council and has been funded by “defra” and the “European Agricultural Fund for Rural Development”. 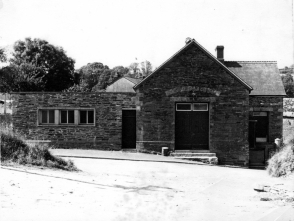 The St Neot and Warleggan Community Archive has been partly equipped by the “St Neot Historians”, St Neot Camera Club and will also house equipment obtained from the Heritage Lottery Fund for use with the “St Neot’s Little Acorns and New Oaks” Oak Apple Day Celebrations and Archiving. The Oak Apple Day Celebration has been funded by the Heritage Lottery Fund with contributions from St Neot Parish Council, Cornwall County Council, St Neot Local Historians and Warleggan Historians. 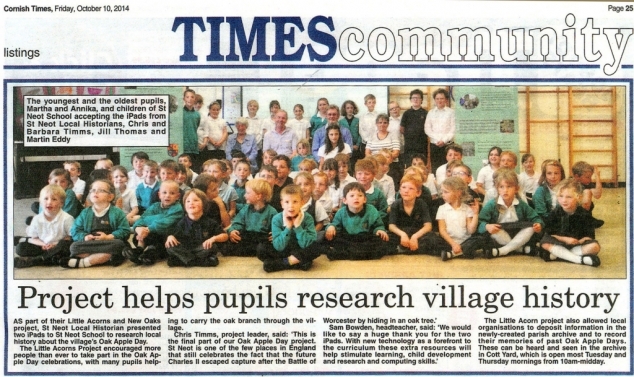 The Oak Apple Day Ceremony held in St Neot every 29th May has been celebrated for many years. The enhancement of this event and importantly its archiving has been made possible by obtaining a generous grant from the Heritage Lottery Fund. A small group of locals led by Martin Eddy also including John Keast, Jill Thomas, Brian Williams, Barbara Timms, John O'Neill and Chris Timms completed the grant application and have organised, with the help of many local groups/clubs and the Church, additional features to the established occasion for the 2013 event. The St Neot Local Historians have lodged their archive in the archive room also. 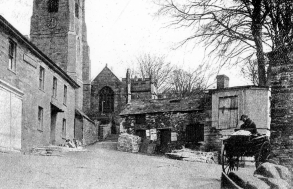 The St Neot Local Historians meet on the first Monday of the month in the Village Institute. The archiving and digitising of the Oak Apple Day event material and the cataloguing and digitising of the Historians material is being carried out by Isobel Harvey, Maggie Smith, Barbara Timms and Chris Timms. A series of sessions will be held to teach digitising and archiving skills. The Archive will hold a series of sessions when individual residents and groups can view and reminisce about its contents. We now have a Project Group embarking on a wide variety of Cornish archeological projects under our Project Officer Martin Eddy. Please see the Project Group page. Cott Barn has been renovated and restored over 2012. To view photos recording this click here. The project was finally finished just before Easter. The opening was postponed by the very bad flooding with less that a week to go before moving in. Moving in should have taken place in December 2012. A comprehensive cataloguing programme is currently taking place and will gather momentum after April 2013. Until the catalogue is finished there is only a representative selection of the archive we have accumulated over the years on this website. As the evaluation and listing of what we have got progresses more will appear on this site. It will be updated on a regular basis. talks to Fernley Rowe (left) at opening ceremony. 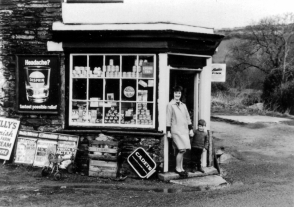 There are hundreds of photos and a number of stories about "St Neot Families" in our archive. These also are being processed and will appear when completed. They may be in the form of list with a request to view at the Cott Barn as there are too many to put on the web. We don't have a complete archive of St Neot News but have some of them. An example from January 1908 can be seen here. There have been many descriptions of the beautiful painted glass windows of our Church here in St Neot, we have a small booklet of Rushforth's description in the archive. We have a large amount of past Parish Council records which we will soon start to catalogue, when this is done there will be a page of "Council Records". 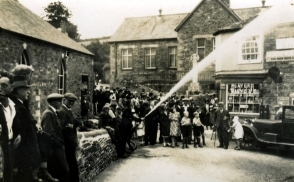 In the past the St Neot Local Historians organised a number of public exhibitions showing many photos, there is a page dedicated to Exhibitions. Please feel free to use the "Contact us" form if you have any questions or would like further information. We also welcome comments you may wish to put on our Guest Book page. 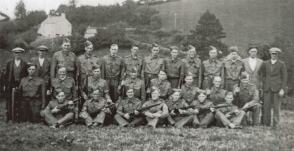 There are a number of small websites like this run by local history group volunteers in Cornwall. Click here to view the Links page. More information about the St Neot Group, its meeting times and the village can be seen on our village website via this link. We also publish a 24 page monthly newsletter, the St Neot News website can be viewed here. 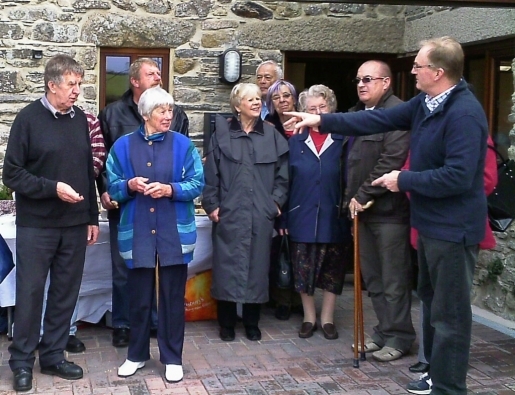 The Archive is called the Olliver Room, it was named this in recognition the kind gift from Agnes Olliver of a room specifically to house the Village Archive.